Tonight fourteen different students from seven different academies presented their graduation collections during Amsteram Fashion Week. They showed their finest work in front of a large fashion audience and in front an international jury. That jury had to decide which one of the students had the best collection. 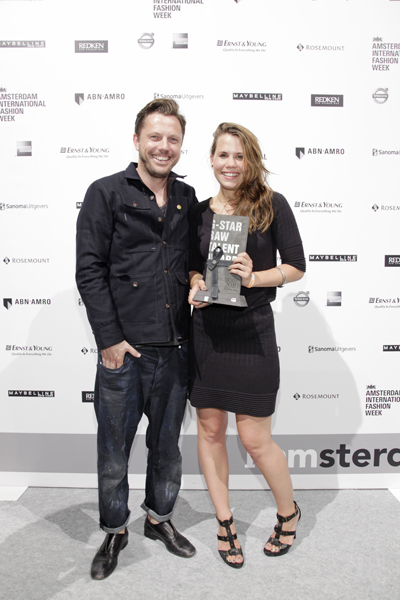 After a long catwalkshow and some wise deliberation the jury named Marije de Haan as the winner of Lichting 2010. With her menswear collection named ‘flatliners’ Marije wins a money prize of 10.000 and gets a chance to work with G-star during the next New York Fashion Week. With the money she would like to expand her collection. Marije studied at the Royal Academie of Arts in the Hague. Her menswear collection was inspired by crime-scene photography from the beginning of the twentieth century. We wish her all the best of luck and hope to hear more from this new designtalent very soon!